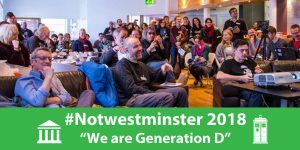 LocalGov Digital is proud to support Notwestminster, a free event for everyone who has something positive to say about local democracy and anyone who is up for the challenge of making it better, on 16th & 17th February at The Media Centre, in Huddersfield. The Notwestminster main event includes participant-led workshops, lightning talks, creative activities and lots of opportunities for making contact with others who are interested in in local democracy, citizen engagement, open data and civic tech.Workshops include open government, local problem-solving forums, learning from One Team Government, involving young people in democracy and lots more. Hosted by Democracy Club and the Notwestminster network, this is an opportunity to get involved in practical projects to strengthen our local democracy, with a particular focus on elections and voting, hustings, democratic content and decision-making in councils. The special Notwestminster PechaKucha Night will feature a series of fun and informative, quick-fire presentations from members of the Notwestminster network and our friends.